LG has officially launched the LG Optimus G in India and it is available 30990Rs and Samsung galaxy s III is available at price 29500Rs. Price and configuration almost similar to Samung galaxy s3. 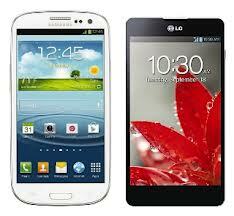 The LG Optimus G and the Samsung Galaxy S III are the best Android smartphone available in current market. LG got good processing power and 2GB ram, you can run any game without any lag with inbuilt powerfull Adreno 320 GPU. Samsung Galaxy s3 is light in weight and good camera performance. Optimus G has the 32 GB inbuilt memory but not SD card support, Samsung has 16 GB memory and memory can be expandable up to 64 GB. Both phones offer more or less the same software features. Samsung offers two extra unlock methods but LG offer clock style unlock. Samsung TouchWiz is Smart stay prevents the screen from locking as long as the front-facing camera can see your face. LG offers similar feature with Wise screen. LG’s QSlide feature is almost same as Samsung’s Pop up play. Optimus G does have Dual Screen Dual Play – You can share your screen on TV or monitor, Galaxy S III has an MHL-enabled microUSB port it just mirrors the phone’s screen on the external monitor. Both smartphone contains the equal good software for regular use. I liked both phone software personally. I like the Samsung android update release schedule for its android but LG lags in android OS upgrade. Conclusion: Seems LG like a power house, the S3 is much more desirable, has a better performing camera, and UI that has been tried and tested. I liked the Samsung android upgrade policy. Share your thoughts which one you want to buy/ preference which help to other user/android fans ?